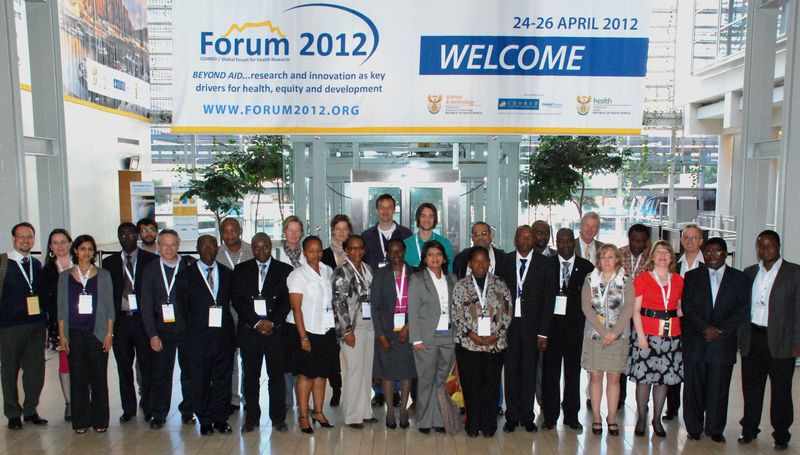 Researchers, policy makers, partners and representatives of COHRED that participated in the Research for Health Africa (R4HA) satellite session at Forum 2012 on the 23rd of April 2012. R4HA is an initiative aimed at strengthening the governance of research and innovation for health in Africa and is supported by a four-year grant from the Government of the Netherlands. The programme focuses on the creation of practical tools and methods that countries can use to optimise research governance, which include institutional mapping, establishing national priorities and policies and developing web-based research management information systems. Initial focus is on the countries of Tanzania, Mozambique and Senegal. Dr. Samba Cor Sarr, du Ministère de la Santé Sénégalais, parle de son partenariat avec COHRED, et de l’importance du Forum 2012 par rapport aux débats sur le dépassement de l’aide au développement. Dr. Samba Cor Sarr talks about his partnership with COHRED and the importance of the Forum 2012 in relation to the ‘Beyond Aid’ debate. Nilsa de Deus do Instituto Nacional de Saúde fala sobre o principal papel de sua instituição em investigação em saúde e também enfatiza a relevância da inovação e da transição para um cenário auto sustentável no desenvolvimento de Moçambique. Nilsa de Deus from the National Institute of Health speaks about the main role of her institution in health research and also emphasizes the relevance of innovation and the transition to a new self sustainable scenario in Mozambique’s development.